Washdown Scales were recently supplied to a smallgoods manufacturing plant located at Wacol in Brisbane’s west. Supplied by Accuweigh’s QWM branch at Geebung, the Washdown Scales are being used in an area where previous scales have regularly failed due to water damage. Accuweigh’s AWS series Washdown Scales are completely waterproof and rated at IP69K – the highest industry ranking for sealing against dust and water. 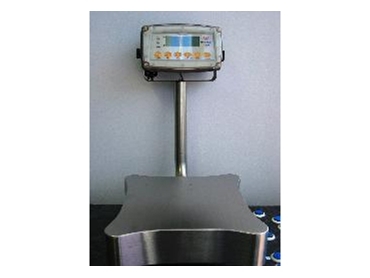 The AWS Waterproof Scales are designed to withstand high pressure water streams from any angle at pressures up to 1450 PSI and at water temperatures up to 80ºC. These Washdown Scales are ideal for use in food preparation areas as they don’t require fitting with waterproof hoods or splash guards when the room is being cleaned with high pressure hoses. Cleaning staff can hose this Washdown Scale from top to bottom as it can’t be damaged by normal wash down procedures. The capacitive keyboard on this Washdown Scale allows the entire front panel to be constructed as a single piece to eliminate seams and joins that could break down or leak. The capacitance effect of the keypad senses an operator’s finger without requiring any actual pressure on the key – even when wearing gloves. Accuweigh is Australia’s largest industrial weighing company and has eight branches across mainland states providing complete after sales service support on all scales and weighing equipment.